Published in the journal Geophysical Research Letters on Thursday, the study uses satellite observations to demonstrate that the decline in atmospheric chlorine that resulted from the implementation of the Montreal Protocol, enacted in 1989, has led to "about 20 percent less ozone depletion during the Antarctic winter than there was in 2005—the first year that measurements of chlorine and ozone during the Antarctic winter were made by NASA's Aura satellite." 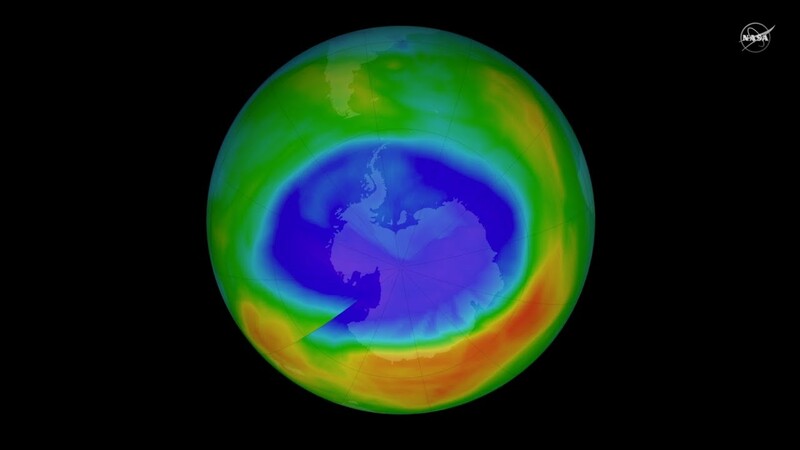 "We see very clearly that chlorine from CFCs is going down in the ozone hole, and that less ozone depletion is occurring because of it," Susan Strahan, an atmospheric scientist from NASA's Goddard Space Flight Center and one of the study's lead authors, said in a statement. In a video (above) published on NASA's website on Thursday, Strahan explained the significance of the study and why the Montreal Protocol should be celebrated as a great success. While CFCs and other ozone-depleting substances were phased out by the mid-1990s, the study notes that the Antarctic ozone hole—which was first discovered in 1985—"is healing slowly" because the man-made substances that caused the hole in the first place "have long lifetimes." Given that fact, researchers believe that it could be several decades before the ozone hole is eliminated altogether. "CFCs have lifetimes from 50 to 100 years, so they linger in the atmosphere for a very long time," noted Anne Douglass, an atmospheric scientist at Goddard's Space Flight Center and one of the study's co-authors. "As far as the ozone hole being gone, we're looking at 2060 or 2080. And even then there might still be a small hole." Responding to the study's results on Twitter, Greenpeace called for the success of Montreal Protocol to be used as a model for tackling the climate crisis. "We've stopped harmful pollutants before and nature has healed itself," the group observed. "Let's cut carbon emissions now and allow nature to heal itself again."